For the second time in our city’s history we are about to host a national championship in competitive bass fishing! 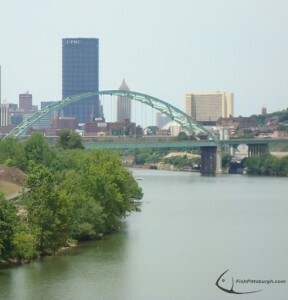 In the summer of the 2005 Pittsburgh hosted the Bassmaster Classic. This week we will be hosting the Forrest Wood Cup! The Forrest Wood Cup is the national championship for the FLW Tour and Series. There will be 77 professional fisherman bidding to be the number 1 fisherman in the world and win the largest top prize to date. The winner will recieve a total of $1,000,000.00! Needless to say these guys are going to lay it all on the line this week. There are several ways for professional fisherman to qualify to compete in this years Forrest Wood Cup. I would like to start by saying that there is no easy way to qualify for this tournament. No matter what path that the anglers took they had to compete against hundreds and sometimes thousands of competitors to get to this point. The most qualifying positions come from the FLW Tour. Based on the end of the year points standings 40 professional fisherman qualify for the tournament. There were also 20 anglers that qualified through the FLW Series BP Eastern. Another 10 anglers qualified through the FLW Series National Guard Western. The bulk of the qualifiers come from those 3 circuits. The top angler in each of the 5 Stren Series circuits also qualify. The 2 hardest was to qualify is by winning the BFL All-American and the TBF National Championship. Those 2 qualifiers have to compete against more anglers than any other qualifier to get into the Forrest Wood Cup. They are fishing the 3 rivers of Pittsburgh Pennsylvania. On the Allegheny River the competitors are allowed to head as far up river as the sixth lock. The sixth lock is located just above the in downtown Kittanning Pennsylvania. The locks are very time consuming and leave little time to fish so look for most guys to lock less than 3 times. As for the Ohio River the competitors are allowed down stream as far as the Montgomery Locks and Dam. The Monongahela River will open open to fishing up to and including the Youghiogheny River. Chances are that most competitors will fish multiple rivers during the competition. Located at the David L. Lawrence Convention Center, the Family Fun Zone and Outdoor Show will offer something for everyone in your family at this event. For the kids there will be games, simulators, and a trout pond. That doesn’t mean that big kids can’t have fun doing those as well. Other features include: meeting professional anglers, demonstrations from vendors and the anglers, and food. This is a true family environment so please be curtious. For specific times and events, please check on the FLW Outdoors website (www.flwoutdoors.com). If you have never experience a live weigh-in at any level you are in for a real treat. Even if you have never fished you will be impressed by the bags of fish that are brought to the scales (alive) and later released back to the rivers. Live weigh-ins will occur Thursday-Sunday at the Mellon Arena. Once again for more details please check out the FLW Outdoors Website and for specific times. If all of that isn’t enough to bring you out to all of the championship festivities then perhaps the free concert performed by Eric Church will help bring you to the final day weigh-in. I would like to take a minute to wish all of the competitors the best of luck in this years Forrest Wood Cup. There are many talented professional all competing on multiple water ways that most are not conditioned to fish. Now I would like to wish our hometown professional angler Dave Lefebre a special good luck. This is as close as you can come to having home field advantage in this sport and I am sure that he plans to capitolize on his oppurtuning. Dave grew up fishing our local waters and still live in Western Pennsylvania with his family. Show your support and let him know that we are in his corner at the weigh-ins this week. If you plan to follow the anglers in your boat remember a couple of things so that you don’t interfer with their chances of catching fish. First, give them enough room to make their casts. Second, stay behind them. Don’t get out infront of their boat trying to get a look at what they are doing or how they are doing it. Bring a set of binoculars to help you see instead. Another thing to remember is to shut your sonars, combustion engines, and radios off. Our rivers can be difficult enough to fish without adding other bad elements into the equation. Finally, ask them if you are in there way or what direction they are heading so they you aren’t in their way. They will appreciate that more than anything and after the days competition has concluded, will be more than happy to answer questions and sign autographs for you. This is the only sports which you can be in the field of play with the professional athletes, so let’s remember that we can have an impact on the outcome of the tournament. Now, go have fun and share a special memory with your family and friends. Way to go on day one Dave! Good luck the rest of the way. Dave, congratulations on your 8th place finish. We know it didn’t go quite the way you wanted it to go, but you represented Western Pennsylvania well. Some random thought about the Cup. 1.) I could not get over how packed the convention center was on Sunday. The turnout was unreal. 2.) How accomodating the pros were for the kids, especially Ish Monroe. Ish was talking to a few people and my buddy and I had his two nephews with us. The one saw Ish was talking and was standing patiently off to the side (like 25 ft away) and Ish caught him out of the corner of his eye, stopped his conversation and walked over and asked the two boys if they would like an autograph. He then stood there and talked to them for a couple of minutes about what they like to fish for. The boys loved it. 3.) I was slightly dissapointed in the crowd at the arena on Saturday. However they sure made up for it on Sunday. 4.) Eric Church put on a heck of a show. 5.) FLW needs to shorten all the pre-weigh-in festivities. I consider myself a big fan, and I was plain wore out before the guys even weighed in. 6.) It became very clear to me just how much money some of these companies pump back into our industry. I definately will impact my fishing purchases going forward. 7.) I was dissapointed in the lack of vendors at the expo. I thought it was nice, but it did not even come close to when the Classic was here. Having said that, if you had kids there they were in heaven. To keep a 7 and 9 yr old interested for 4 hrs is no easy task, but they did it. 8.) A couple of vendors had big missed opportunities. Damiki baits and Koppers Live Target lures had nice displays that generated a lot of interest, but they had nothing for sale. The Damaki guy said his retailer cancelled on him and that he knows that he could’ve sold a trailer full of baits and every rod he had at the show. 9.) The FLW guys did a nice job with the updates throughout the day and the videas they uploaded. Having said that, they need to put together some kind of daily coverage that can be shown the weekend of the event. 10.) How well spoken some of the western pros are. Saleweske and Meyer really spoke well in front of the crowds. 11.) Lefebre and Nixon fell victim to something that has happened to most anyone who tournament fishes. In prefishing (and Day 1) they found the mother-load of fish and thought they were on the fish to win the tournament….only to have changing weather and water conditions make those fish dissappear. 12.) Jann from Wee-Vee is a super-nice guy who really stands behind his product. 13.) The shuttle service back and forth from the convention center to the arena was a nice touch. 14.) Did you see the Yamaha 5.3L? I couldn’t get over the size of that thing. I think you hit it right on the head. The family fun zone is just that. Meant purely for family to come and spend the day. Maybe not necessarily for the serious anglers, but still a good time. That Yamaha motor was crazy! Another great product was the cull-buddy. I really liked that product and can see it saving a great deal of time. 7.) I was dissapointed in the lack of vendors at the expo. I thought it was nice, but it did not even come close to when the Classic was here. I agree. I went there looking to get some new cutting edge lures but walked out empty handed. Do you by chance remember the name of the lure company that was setup that had all the top water lures? I do not recall seeing any topwater companies there. I remember Damiki, Koppers, Venom, Cabelas, some UV-paint job company and a couple soft plastics companies and that was it. I remember there was a company setup in the last row of vendors, i’m thinking second or three down, with a big TV setup showing there products and I thought they were all topwater lures. Maybe they weren’t all topwater but I know they had a bunch of lures that were. I was also thinking that they were a local PA company.